In 2003, the first Rubik’s Cube competition since the televised 1982 World Championships was organised by the team that would later form the World Cube Association. This competition held a variety of weird and wonderful events, most of which are still held at competitions all around the world to this date. One of these events was 3x3x3 One Handed (abbreviated to OH). This involved solving the puzzle in the same way that a competitor would speedsolve a Rubik’s Cube normally, except with only the use of one hand. This event has received worldwide interest, and every day becomes more and more competitive. Here, we will take a look at the history of the much-loved event and how the both methods and times have improved throughout its lifetime. In the early days of the one-handed event, progress was relatively slow due to the poor quality of the puzzles available at the time. At the first competitions, the best solvers clocked in times of just over 40 seconds. After these competitions improvement was rapid at first but continuously steady. By the end of 2004, Chris Hardwick had lowered the single World Record to 25.95 seconds and Shotaro Makisumi had the average record of 39.25 seconds. By the end of the following year, the single was even lower at 22.05 seconds and the average had dropped drastically to mid-26 seconds. By this point in history, competitions were starting to pop up all over the World, with 2007 seeing over 50 competitions worldwide, so even more speedsolvers were starting to get the chance to compete. Also around this time there were some relatively simple speedcubes available to the dedicated solvers (although these puzzles are incredibly poor in comparison to those of the current year), and the launch of the Speedsolving forums in 2006 led to the sharing of ideas, modifications, lubricants etc. which all contributed to the improvement of times. By the end of the decade, the single and average World Records had approached times deemed incredible for two handed solves just a few years back. 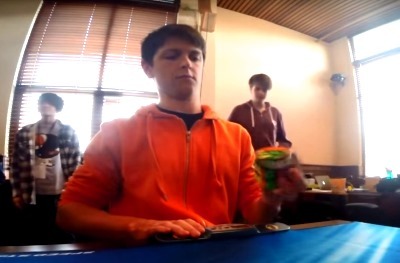 By 2011 Feliks Zemdegs was starting to show his incredible talent across all events, and the one-handed event was no exception. He secured the World Record single and average for himself of 11.16 seconds and 14.41 seconds respectively, knocking nearly 2 seconds off of the previous record-holder’s average time. Towards the end of 2011, Michal Pleskowicz made history by securing the first sub-10 single solve in official competition, with a 9.53 single solve. He also lowered the average below 13 seconds. Times continued to improve as the average dropped below 11 seconds and the single below 9. In May of 2015, Haixin Yang managed to solve the puzzle one-handed in 8.27 seconds, thanks to a Last Layer skip during his solve (a 1-in-15,000 probability of occurring). This single solve was set to last for a long time, however just 7 days later Feliks Zemdegs made history with a 6.88 single solve. This solve was highly controversial, however, as the scramble for the solve was performed incorrectly. When asked to perform the scramble again, Feliks was unable to due to the mis-scramble. Upon reviewing video evidence, it was revealed that the scrambler had accidentally performed an R move instead of an R’ move. After further analysis, a few key facts arose from the scramble: The optimal solution for the solve involved the same number of moves as the actual scramble (18), and due to the mis-scramble being unintentional, without Feliks’s involvement or recognition of the error, and also being a state that the scrambling program used by the WCA could generate, the time was allowed. The current World Record average is slowly approaching sub-10 seconds, and currently sits at 10.31 seconds by Max Park. However, the single World Record remains standing, and is currently the second longest-standing World Record in the WCA (and most likely will continue long after the current longest standing record is broken). After over two years, Feliks remains the only speedsolver to have secured a time below 8 seconds (in fact, he has 3 sub-8 single times), with his second fastest to date being a 7.55 single solve. Justin Mallari managed to place second in the World with his 8.04 single in 2016, but nothing has come close to the 6.88 single solve. Single handed solves require a lot of practice and completely different finger tricks. 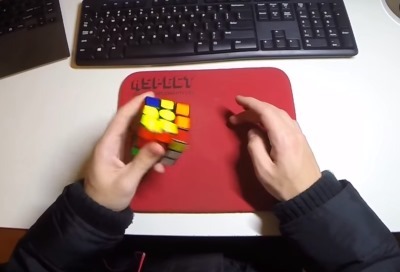 Most cubers prefer to use their left hand which makes it easier to perform R-U moves. For the most part, one-handed speedsolvers use the exact same method as they do for regular two handed solving – CFOP/Fridrich. However, some speedsolving methods aren’t as viable for one-handed solving. One example of this is the Roux method. The Roux method relies heavily on M slice moves, which while incredibly fast and efficient for 3x3 solving are difficult to perform efficiently with just one hand. People have found ways to do this relatively fast, but not to the extent that people have pushed the Roux method two-handed. The COLL algorithm set, which provides algorithms for all corner orientation/permutation possibilities given that all edges are correctly oriented, and results in a limited number of PLL cases, as the corners are already solved, which are all easy and efficient to perform one-handed. The more determined speedsolvers may choose to remove the PLL stage entirely by learning ZBLL, an algorithm set that, provided all edges are correctly oriented, solves the remainder of the last layer in one algorithm. A less-advanced way of improving at one-handed than learning the 500 algorithms required for full-ZBLL is to learn one-handed specific algorithms for certain last-layer cases. These algorithms mainly rely on R and U moves (these are the most efficient for fast turning using one hand). The OH event for the Rubik’s Cube is a different catch on the normal event of solving the cube with both hands. It is a much more intense challenge compared to the original as you are restricted to how fast and easily you can move the cube with a single hand. The current world record average for the one handed event is 9.99 seconds and is held by Max Park who is a famous American speedcuber. Feliks Zemdegs not surprisingly holds the world record single for the event at a time of just 6.88 seconds in 2015 (image below). The one handed event is solved the exact same way as a normal 3x3 two handed cube but it just a bit harder as it removes a hand. Generally done with the opposite of your main hand and uses the pinkie and index finger to move the cube around. Many people have competed in the popular OH event within various competitions around the world. If you use your left hand to solve with one hand then your algorithms will need to use R and U moves and if you solve with your right hand then you will need algorithms that require L and U moves. Many people prefer to use non magnetic cubes like the Valk 3 or Gan 356 Air S for the OH event as it makes it easier to turn each layer in comparison to magnetic cubes like the Gan 356 Air SM or the QiYi Valk 3 Power M. This is because the magnets usually create a hard to push force when trying to turn the layers of the cube which slows you down as you solve. CFOP and Roux are the most used methods for OH as they can be done the same with one hand compared to if you solve the cube with two hands, the only change is that some PLLs will be harder to do with one hand as some require M moves but you can easily change or learn a new PLL to fix that. It is recommend not to use beginners method for one-handed solves as it requires a lot of rotations and turns compared to more advanced methods like CFOP and Roux. A key part of the solve while doing OH is the way we hold the cube. Most people grip the cube to have a finger at the back (ring finger), they have their pinkie on the back or front of the R layer and their index finger on the U layer, on the F face is generally your thumb supporting the cube and it leave your middle finger hanging in the air ready to do U2 flicks. People generally hold the cube like this because it is the most comfortable way of holding it and it is the easiest way to turn the cube with just a single hand. See below left for the front view on how most people hold a cube one handed and in the right the back view of holding the cube single-handedly. Learn some extra PLL (permutations last layer) algorithms for the cube if you solve it with CFOP so that you won’t have to struggle to try do M and M’ moves as they are very difficult to execute with just one hand. Some people use the Roux method for solving the cube as it is a lot more move efficient and gives you a faster time. Another good tip for solving with one hand is to "abuse the table". This means to keep the cube using the table for support and making moves that normally would be very hard without this extra support. The moves generally done by abusing the table is M and M’ as they are very pesky to do without it. Finally the best way to do better is of course continuously practice in order to make the biggest change in your times. With practice your times will drop and your muscles within the hand will improve stopping your hand from cramping as often and will get them use to the high usage and pressure on the hand.